To disturb the tranquil and largely harmless existence of Pasteurella Pestis something had to happen to make the rodents leave their homes. With them, inevitably, would travel their attendant fleas and, within the fleas, a cargo of deadly parasites. We are unlikely ever to know exactly what it was which caused this particular rodent migration. Kiang (Yangze) and Hoai River systems, China, 1333: There was a terrible drought and famine in these River districts, followed by violent storms and floods in Kingsai. Tsinchou Mountain disappeared, leaving a huge cleft in the earth. Honan and Houkouang, China, 1334: A drought here was followed by swarms of locusts, disease, and famine. The mountains of Ki-ming-chan collapsed, leaving a lake one hundred miles across in their stead. Canton, China, 1334: "Subterraneous thunder" was heard here. Earthquakes and floods continued here and elsewhere until 1345. Southern India, circa 1337: A Flemish cleric recorded a letter he received from a friend in the east: "Hard by Greater India," frogs, serpents, lizards, scorpions, and other vermin rained from the sky. The next day "lightning and sheets of fire fell upon the earth, mingled with hail stones of marvellous size." The third day fire and "stinking smoke" fell, burning entire cities. The southern coast was "infected" by a disease, which was blamed on the southern wind. There also appeared "unusual insects, strange worms, big-bellied toads, unknown frogs with tails with which the medical men of the period were not familiar, large quantities of all kinds of beetles, large, black vineyard moths, large spiders, gnats 'of uncanny shape and colour.'" [Nohl] An earthquake and a poison cloud manifested themselves in Cyprus. Mount Etna erupted, and there were violent storms in France. Lake Issyk-Kul, Kirgiz, 1338-1339: The Russian archeologist Chwolson uncovered evidence of an extremely high death rate in this area during those years. Nestorian Christian grave markers blamed a plague. "Disturbed" for whatever reason, the disease that will one day be called the Black Death spread from Central Asia to China and India. Kirgiz steppes, 1346: Janibeg Khan, leader of the Kipchaks, passed across these vast plains on his way to the West. The plague took root among his soldiers. Kaffa (now Feodosiya), 1346: Janibeg attacked Kaffa, a major trade artery between Asia and Europe. An Italian notary, Gabriel de Mussis (1280-1356) described what happened: "Infinite numbers of Tartars and Saracens suddenly fell dead of an inexplicable disease . . . the Tartars, fatigued by such a plague and pestiferous disease, stupefied and amazed, observing themselves dying without hope of health ordered cadavers placed on their hurling machines and thrown into the city of Caffa." The plague spread quickly in the besieged city. Those who could boarded galleys and sailed for the Mediterranean. Messina, Sicily, October 1347: "Twelve Genoese galleys were fleeing from the vengeance which our Lord was taking on account of their nefarious deeds and entered the harbour of Messina. In their bones they bore so virulent a disease that anyone who only spoke to them was seized by a mortal illness and in no manner could evade death." So wrote Michael of Piazza, a Franciscan friar. The plague raged across the island until April 1348. Meanwhile, the plague spread of its own accord to other Mediterranean islands. Europe in general, 1347: Earthquakes struck Italy. 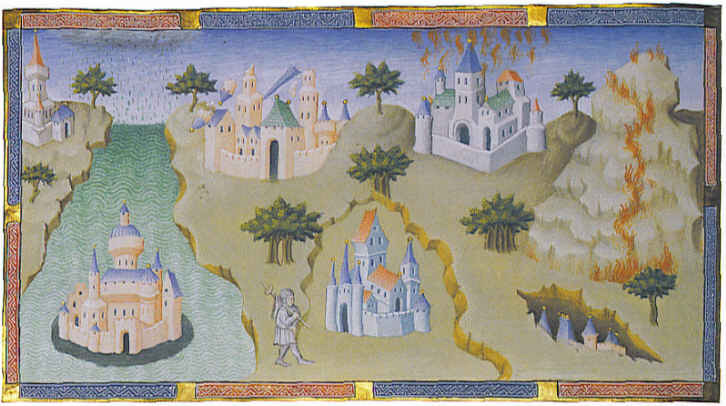 Cities, castles, and mountains were leveled or swallowed by the earth. A vile-smelling mist from the east passed through Germany and Italy. Pisa, January 1348: Two freight ships carried the plague from Messina to Pisa. "And thereupon," writes the chronicler Sercambi, "there began a great dying in Pisa, and from there spread over the whole of Tuscany." Genoa, January 1348 onward: Six-sevenths of the population died of the plague. Venice: Venice was infected by ships that sailed around the boot of Italy from Messina. In the year of Our Lord 1348 the deadly plague broke out in the great city of Florence, most beautiful of Italian cities . . . At the onset of the disease both men and women were afflicted by a sort of swelling in the groin or under the armpits which sometimes attained the size of a common apple or egg. Some of these swellings were larger and some smaller, and all were commonly called boils. From these two starting points the boils began in a little while to spread and appear generally all over the body. The pestilence appeared in Dalmatia on January 13, in Orvieto in May, Rimini on May 15, and Parma in June. It reached Orvieto in the entourage of the Ambassador of Perugia. The mortality in Siena began in May. It was a cruel and horrible thing; and I do not know where to begin to tell of the cruelty and the pitiless ways . . . the victims died almost immediately. They would swell beneath the armpits and in their groins, and fall over while talking . . . in many places in Siena great pits were dug and piled deep with the multitude of dead. And they died by the hundreds, both day and night, and all were thrown in those ditches and covered with earth. And as soon as those ditches were filled, more were dug. And I, Agnolo di Tura . . . buried my five children with my own hands. The plague hit Narbonne the first week of Lent; Lyons, Burgundy, and Paris in the summer; and finally Normandy, Gascony, Poitou, and Brittany. Pope Clement VI consecrated the Rhone River so that the multitude of corpses could be dumped in. It is almost impossible to credit the mortality throughout the country. Travellers, merchants, pilgrims, and others who have passed through it declare that they have found cattle wandering without herdsmen in the fields, towns and waste-lands; that they have seen barns and wine-cellars standing wide open, houses empty and few people to be found anywhere. Farther south the disease hopped the Alps from Italy and entered Switzerland. After leaving Padua it oozed up the Etsch like a miasmic cloud and appeared in Trento on June 22. From there it crossed the Tyrolese Alps into Bavaria. It then passed into Austria and Hungary. Germany, 1348: An odd note can be found in Nohl's The Black Death. "Of the children in Germany it is even said that they passed away laughing and singing." Did they pass to a better place? The land of the Erlkonig and the Pied Piper? At least there was some mercy, because elsewhere "the pestilence tormented the people to such a degree that they rent their hands and arms and tore out their hair." A century before Vlad the Impaler, Transylvania suffered: "In many places in Transylvania they assailed one another in the alleys and streets, and in their frenzy bit and tore each other like dogs and perished miserably." Dorsetshire, England, July 7, 1348: A French ship docked at Melcombe Regis, Dorsetshire, bringing the pandemic. The Black Death hit Devon, Somerset, and Cornwall and headed east along the coast. It spread to Gloucester and Oxford; it entered London between September 29 and November 1. Canterbury, Kent, Dover, and Sandwich were badly hit. Winchester was decimated by Christmas. Europe in general, 1349: The Black Death reached its height in London by February. By Easter, it was said, scarcely one person in ten was left alive. It returned to Vienna in early summer, then passed on to Hungary and Poland. In March it revisited Switzerland by travelling up the Rhone to Lucerne and Zurich. In March, the plague spread from the Severn Valley into Wales. Sometime in the spring ships from Bristol and Chester carried it to Dublin. From there it spread across Ireland. The Italian poet Petrarch had an interesting insight into the future [it is rather surprising that he believed there would even be a future]. He wrote to his brother in May or June 1349: "Posterity, will you believe what we who lived through it can hardly accept? We should think we were dreaming, had we not the testimony of our opened eyes, encountering on our city walks only funerals, and on our return finding our home empty of our dear ones. Thus we learn that our troubles are real and true. Oh how happy will be future times, unacquainted with such miseries, perhaps counting our testimony as fabulous!" Bergen, Norway, May 1349: A wool-laden ship from London was spotted drifting in Bergen harbor. The plague had killed the entire crew. The ship ran aground, but before the authorities could quarantine the area, the Black Death spread ashore. Two-thirds of the population of Norway perished. Then the dreadful pestilence made its way along the coast by Southhampton and reached Bristol, where almost the whole strength of the town perished, as it was surprised by sudden death; for few kept their beds more than two or three days, or even half a day. Then this cruel death spread on all sides, following the course of the sun. Germany, 1349: The plague followed the Rhine to Cologne and spread across the rest of Germany by December. At Weimar, five thousand died; at Limburg, twenty-five hundred; Bremen, seven thousand. Two-thirds of Pomerania's inhabitants died; four-fifths of Schleswig's. At the Erfurt plague pits, twelve thousand were buried; at Leubeck, nine thousand. Hundreds of villages lay empty. Wolves and other animals grew fearless and roamed at will through abandoned cities. And Darkness and Decay and the Black Death held illimitable dominion over all. Chester: Whoa! That was frightening. I'd heard of the Black Death, but I didn't know all the terrible details. Yet I almost laughed at that quote about the migrating rodents at the beginning. You're going to have it that the Pied Piper caused it. M: Yes, as a purging of evil humanity -- as he sees it, of course. C: What was with the earthquakes and falling things at the beginning? M: My take on the Other World is different from some writers'. Some fantasy authors make no mention of our earth at all -- their stories lie in a magical place separate in every way from mundane reality. I say that this world we're constructing has impacted ours throughout history, and we can glean its influences from myth, legend, and odd historical anecdotes. Since the fantasy world lies in another dimension, I decided that strange geological and atmospheric phenomena of the sort Charles Fort wrote about might indicate an "overlapping" of worlds -- tectonic and magnetic stresses passing between them. The frogs from the sky, the unknown insects, and the vast locust swarms might have come from someplace beyond earth. I'll just say Fort's books will be another influence on the Fantasy World Project. C: Speaking of that, it seems we have a major fantasy character now in the Piper, but we don't seem to be doing much work on a "secondary world." We've just seen folktales and strange bits of history from Europe and Asia. We'll want to see the actual fantasy world eventually. M: Oh, we'll begin mapping the Other World when we reach a couple of other books. First, however, there is one more little episode we need to follow the Black Death. The effects of the Black Death had not yet subsided, and the graves of millions of its victims were scarcely closed, when a strange delusion arose in Germany, which took possession of the minds of men, and, in spite of the divinity of our nature, hurried away body and soul into the magic circle of hellish superstition. It was a convulsion which in the most extraordinary manner infuriated the human frame, and excited the astonishment of contemporaries for more than two centuries, since which time it has never reappeared. Both men and women were abused by the devil to such a degree that they danced in their homes, in the churches and in the streets, holding each other's hands and leaping into the air . . . In Liege they were freed of their demons by means of exorcisms such as those employed before baptism. Those who were cured said they seemed to be dancing in a river of blood, which is why they jumped into the air. They engaged without shame in their dances, both sexes as if possessed, in churches and in houses, and while dancing they sang and invoked the names of unheard-of devils. When the dance was over the devils tormented them with violent pains in their chests, so that with terrible voices they shouted that they were dying if they were not tightly wrapped up round their bodies. From September to October their number increased to many thousands. 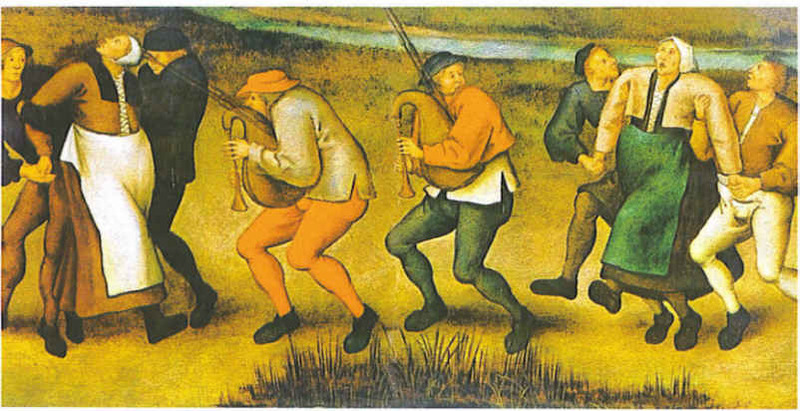 Liege, Netherlands, and surrounding towns, July 1374: Dancers, some coming from Germany, spread the mania or disease into Belgium and the Netherlands, starting at Liege. Some victims claimed that only kicks and blows could cure them, which the common people were happy to supply. Those influenced by this dancing madness attacked people who wore anything red or who wore shoes with pointed toes. They could not stand the sight of people crying, and they resented the clergy in general, to the point that some priests were forced to flee churches when their congregations started to "go over." Cologne and the surrounding areas, September 1374: About five hundred people were affected by the mania in Cologne, and eleven hundred at Metz. "Peasants left their plows," wrote Hecker, "mechanics their workshops, house-wives their domestic duties, to join the wild revels." Gangs of false dancers roamed the streets, demanding food, drink, and money lest they beat up citizens and wreck their property. This outbreak subsided in four months. [T]here began a dancing of young and old people; they danced day and night till they fell down; in Strasbourg over a hundred could be seen dancing at the same time. Several guildhalls were allotted to them, and in the horse and corn market a platform was erected for them and people were appointed to dance with them and make music with drums and pipes, but it was all of no avail. Many of them danced themselves to death. Then they were sent to the monastery of St. Vitus on the Rock, behind Zabern, in wagons, and they were given crosses and red shoes, and Mass was said over them. On the shoes crosses were made, both underneath and above, and chrisam [consecrated oil mixed with balm] was poured over them, and they were sprinkled with holy water in the name of St. Vitus -- this cured nearly all. generally fell into a state of melancholy, and appeared to be stupefied, and scarcely in possession of their senses. This condition was, in many cases, united with so great a sensibility to music, that, at the very first tones of their favourite melodies, they sprang up, shouting for joy, and danced on without intermission, until they sank to the ground exhausted and almost lifeless. Some dancers near the seashore actually cast themselves into the waves to drown. Does this not call to mind the fate of the rats of Hamlin? The idea that a spider's bite caused this "disease" is decried by modern researchers, but maybe there was something odd about these arachnids. "Perotti states that the tarantula, that is, the spider so called, was not met with in Italy in former times, but that in his day it had become common, especially in Apulia." (Hecker, p. 17) Strangely enough, at the time of the Tarantism outbreak in Italy, the inhabitants of Asia believed that the venom of spiders had somehow become more deadly. Basle, Switzerland, 1615: Nohl notes that "the last celebrated case of choreomania is reported from Basle in the year 1615. A servant maid made herself ill by dancing a whole month and wore out the soles of her feet." Two men were appointed by the local authorities to spell each other dancing with her. Drefelhausen, near Weissenstein, Ulm, Germany, June, 1623: Yet St. Vitus' Dance was not quite extinct. A medical man named Gregor Horst observed several women who danced every day until they collapsed in exhaustion at St. Vitus' chapel at Drefelhausen. He was told that they arrived every year, several weeks before St. Vitus' Day (June 15), and danced wildly. This bizarre pilgrimage cured them -- for another twelve months, when they would return. One woman Horst saw had been coming annually to the chapel for twenty years; another was visiting for the thirty-second time. Bargarran, near Glasgow, Scotland, August 1696 to March 1697: One final case marks an ironic end for the Dancing Mania. It was reported by a Dr. Watt of Glasgow in the Medico-Chirurg. Transactions, Volume V. An eleven-year-old girl named Christian Shaw "had fits of leaping, dancing, running, crying, fainting, etc." for several months. A number of clergymen spent shifts to remain in her presence, praying and fasting, until finally the strange curse faded away. On January 19, 1697, however, His Majesty's Privy Council issued a warrant stating that there "were pregnant grounds of suspicion of witchcraft in Renfrewshire," and eleven of the highest ranking nobles and gentlemen in the kingdom set off in search of witches -- and damn if they didn't find some! Several people were arrested, accused of witchcraft, and eventually "seven of the miserable wretches, three men and four women, were condemned to the flames, and the sentence faithfully executed at Paisley, on the 10th of June, 1697." M: So, Chester, can you make any observations about the Dancing Mania? Chester: Like the author Hecker says, it struck me as another episode, a series of strange but similar events that lasted a couple of centuries then faded away. I'm not sure how it fits, however. Your description of the Piper's thoughts made a twisted sort of sense: avenging people with the "Hatto" sequence, taking the children away from our "evil" world in the Crusade and Piper sequence, then trying to wipe humanity out with the plague. Why would that be followed by a dancing madness? Granted it sounds Pied-Piper-like, but . . .
M: In the real world, I'd suppose it was mass hysteria in an era of great stress and poverty, following as it did the Black Death and assorted natural disasters. In the Fantasy World, I'd probably say that the Piper had found ancient artifacts or something to make him more powerful -- maybe he couldn't control his ability to control, contradictory as that sounds. His power "leaked" out wherever he went, and people danced like the rats of Hamlin. C: Maybe there'll be a story in that, eventually. True enough, you couldn't forget something that Piper-ish, once you'd found it! Now, however, we need to think about the "world" part of the Fantasy World Project. M: That comes next, Chester, with a few books that seemed to exist just to outline a secondary world. Once you've reviewed them, we'll see if you don't agree. Hecker, J. F. C. Dancing Mania of the Middle Ages (New York: Gordon Press, 1977 ). Marks, Geoffrey, and William Beatty. Epidemics (New York: Charles Scribner's Sons, 1976). Nohl, Johannes. Black Death: A Chronicle of the Plague (Yardley, PA: Westholme, 2006 ). Wolff, Robert L., and Harry W. Hazard. History of the Crusades, Vol. II: The Later Crusades, 1189-1311 (Madison, WI: University of Wisconsin Press, 1969). Ziegler, Philip. Black Death (Stroud, Gloucester, UK: Alan Sutton, 1991 ). On to Part Three of the FWP, Geography.